They sculpt! They mold! They paint! They foam! And they are amazing! I’m always a television season or six behind the rest of the world, but when I do catch up I find the wildest, greatest stuff. Only last week I recorded the latest season (Season 6) of Face Off. It’s a wonderful little show on SciFi TV that showcases another one of the “Arts”. 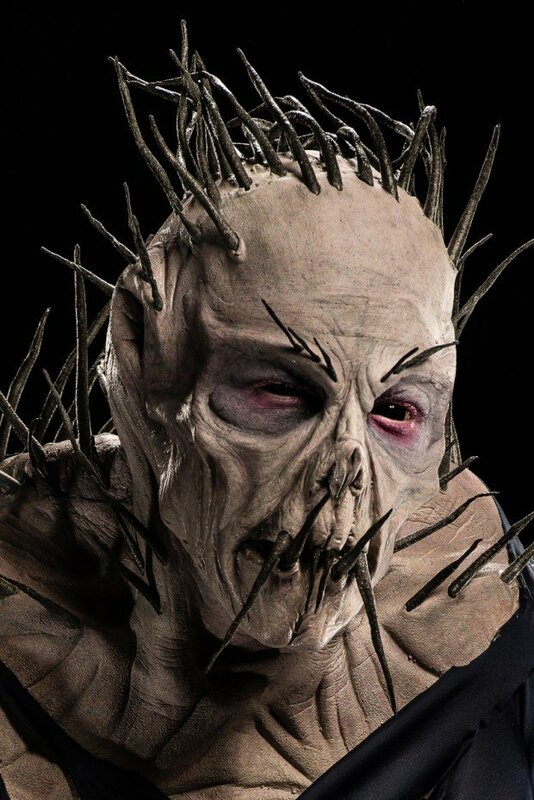 According to the IMDB, Face Off is a competition/elimination series exploring the world of special-effects make-up artists and the unlimited imagination which allows them to create amazing works of living art. Now, I’ve been a fan of shows that highlight personal creativity for years. Take cooking shows. The Iron Chef Japan was one of my earliest introductions into the exquisite beauty of food. Food as Art, as they say. Today’s contestants on Iron Chef America, Master Chef, and even Chopped, create these masterpieces that leave your jaw extended and your mouth open like a bass. I always find myself saying, “Oh…I could do that…couldn’t I?” Or “What didn’t I think of that?” Knowing darn well that I’d need a Master Kitchen, unlimited budget, a plethora of cookbooks and magazines, and a budget the size of a Presidential Dinner just to be clever on the plate. Face Off is the “Master Chef” of sculpturing, molding, and painting. These contestants do things I only dream of. Each week they are assigned a different “creation”: dragons, wizards, robots. They have to come up with their own design, then use a warehouse full of props, materials, and models to create pieces that would easily fit in any blockbuster movie. The most amazing part of this show – aside from the raw talent and imagination – is that these are (to my way of living) KIDS! They are 24. 26. 31. There was an oldie at 41. I can hardly remember what I was DOING at 27 – getting married, I think – but it certainly wasn’t creating magic like this, that’s for sure. They have cherry-colored hair and sticky up hair and mustaches and yellow Mohawks. They look like the guy next door or the girl from Planet 9. But they all share the love of creativity, something that runs through all of us. I am just in awe of anyone who has such phenomenal talent to be able to create something from nothing but their imagination. I happen to be a proponent of writing, but there are so many other artistic expressions out there that I am often in that jaw dropping/bass-mouthed state of being. I encourage you to constantly take a fresh look at the world around you. There are so many beautiful self expressions out there — in words, in sculpture, in jewelry. Encourage everyone who has even an inkling to be artistic to do so. Whether it’s your grandbaby, your girlfriend, or your grandfather. Get them out there and get them to embrace their artsyness. You will find it’s a rewarding feeling on both sides. And who knows what magic will blossom along the way? You’re so right, Claudia. I have to constantly challenge myself to see the world in the first place, then to see it differently.